Oral Images Now includes an additional set of exercises developed for use with adults. Each set has 12 basic oral exercises to help strengthen mouth area for dysphagic clients. Helps specific muscle groups in adults with various neorologic disorders, following head/neck surgery, or with other conditions resulting in swallowing problems. 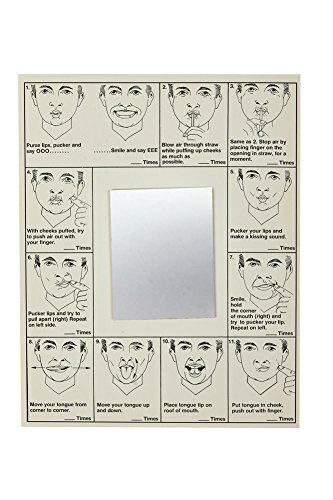 Exercises displayed around a small plastic mirror mounted in the middle of heavy paper. Easy-to-read explanations will facilitate independent practice and self-monitoring by the client. Provides immediate visual feedback. Also includes general suggestions for use and space for individual instruction. Now available in Spanish. Colored, heavy stock paper (8-1/2" x 11"), 3" x 4" mirror. 10/pk.